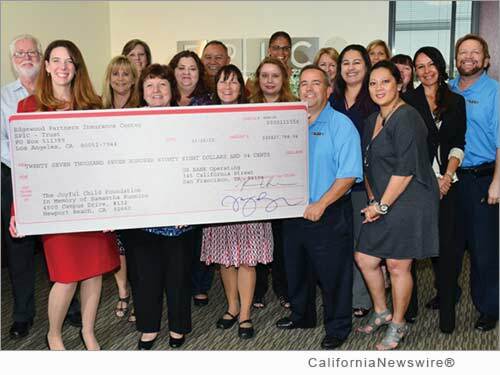 ONTARIO, Calif. /California Newswire/ — EPIC Insurance Brokers and Consultants, a retail property & casualty insurance brokerage and employee benefits consultant, has been working for over six months planning an event that raised nearly $30,000 to support The Joyful Child Foundation's efforts to bring their personal safety training to children in the Inland Empire, California. The Inaugural "EPIC Invitational Golf Tournament" brought together more than one-hundred community leaders and VIP's at Dos Lagos Golf Course in Corona, united in their support of The Joyful Child. The event hosted Inland Empire business leaders; EPIC's insurance carrier partners and many local dignitaries and community leaders, including Deputy Director Greg Folsom of the Riverside Economic Development Council; Bruce Coleman, the Economic Development Director for the City of Murietta; Orange County Assistant Sheriff, Don Barnes; Cyber-Security expert, Kevin B. McDonald; and Vice Chancellor of Riverside Community College District, John Tillquist, just to name a few. The Joyful Child Foundation's goal is to ensure that every child is exposed to personal safety education and opportunities to practice the skills in order to cultivate each child's instinctual response to recognize, avoid, and if necessary, physically resist and escape inappropriate behaviors or violence. "Giving back to our local community in meaningful ways is a cornerstone of EPIC's culture and one of our fundamental guiding principles," noted Dan Ryan, Managing Principal of EPIC's Inland Empire Division. "We have long believed in and supported child safety advocacy and have been very impressed by the work being done by Erin Runnion and The Joyful Child Foundation. We felt it was important to help them advance their mission to protect our children from predators." Joe Cotugna, one of the event organizers and a Principal at EPIC said, "Guests were treated to commemorative gifts along with numerous contests, raffles and dinner. Sunrise Ford even had a 2015 Anniversary Edition Ford Mustang Convertible parked on the course for a lucky Hole-in-One winner." Another EPIC Principal and event organizer, David J. McNeil added, "We are working hard to ensure that our operations in Ontario are synonymous with helping both our Inland Empire business community and local charities and organizations that support the larger Inland Empire and those who live and work here." The Joyful Child's BRAVE Programs are empowering and interactive life skills lessons for students in Kindergarten through 12th grade. The goal is to develop each student's ability to reduce the risk of victimization by providing knowledge and skills about safety. The Joyful Child trains teachers, non-profit partners, and law enforcement agencies to deliver our programs to children and parents. Contributions support our programs and sponsor trainings for those who cannot afford them.